Growing Relaxation and Rejuvenation . Imagine a huge field of lavender in full bloom, bathed in the soft morning light of a glorious June day. Feel the gentle breeze carrying its delicate and alluring scent. Now place this field in the magnificent Sonoma Valley of northern California, and you've set the scene for harvest time at the Sonoma Lavender company, creators of premium quality lavender gifts. Tucked between the Pacific Ocean and the Mayacamas Mountain range, the Sonoma Valley's geography, elevation, climate, and soil -- in many ways similar to the rich agricultural regions of the Mediterranean -- provide ideal growing conditions not only for lavender, but also for the region's world famous vineyards and eucalyptus. Now imagine fleece covered mitts made with this natural lavender. Its fantastic. Add the freshness of Eucalyptus (for the Eucalyptus color) and you have an additional added aromatherapy. Heat it to soothe sore, stiff, nagging muscles and joints. 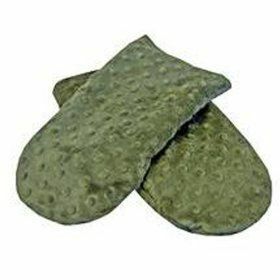 Chill the Mitts to reduced swelling, pain and inflamation. Available in Lavender (purple) to relax body and mind, easing stress and calming the senses. or Eucalyptus (green) which adds fresh eucalyptus to the lavender for clean deep breathing and relaxation. Follow directions when heating in microwave or dryer. Washable fleece cover.